Twelve groups of Iowa State students and graduates pitched their startup ideas to a group of investors and businesspeople Friday morning to mark the end of this summer’s ISU CyStarters program. 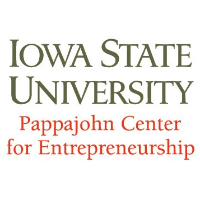 The group belonged to the second cohort of CyStarters, a program run by the ISU Pappajohn Center for Entrepreneurship. The program links students and recent graduates with mentoring and $6,000 or $12,000 of seed funding for individuals or groups along with business-specific support over 10 weeks in the summer. The program was established last year as part of a larger effort from ISU to support startups and economic development in the region. ISU senior Andrew Pauley designed a magnet-locked safe that can hide behind artwork and other areas of the home without requiring the owner to open space in the wall. The safe is hidden by a large-framed picture and is opened with a key card. Pauley told the audience in attendance the safe can be used for firearms or other valuables, and safes are available for immediate purchase. Eric Hare, a doctoral graduate, pitched BulletMatcher as a three-dimensional scanning process to determine if a set of fired bullets came from the same gun. The business is a continuation of his research and is designed to automate bullet analysis with statistical methodology instead of the opinion of a trained forensic examiner. “It’s subjective and it’s error-prone,” he said. “That’s why we built BulletMatcher.” Hare said the company has secured two contracts with ISU’s Center for Statistical Applications in Forensic Evidence, but intends to market to local law enforcement in the future. Recent graduate Colby Hixson started QC Pool Cleaners after cleaning pools to pay his tuition. It looks to provide new ways to provide chemical maintenance for residential pools. Hurd Health Group, headed by doctoral student Dillon Hurd, is looking at ways to improve effectiveness of cardiac devices. He was inspired to take on the project after his wife required heart arrhythmia surgery while he was an undergraduate. “The procedure was fairly simple, but high-risk,” he said. Hurd said his heart replacement would use a wireless charging pack to power magnets implanted in the heart at a low rate of electrical consumption. Those devices are being designed for humans on the transplant waiting list, those who don’t qualify for a transplant or for veterinary use. He estimates commercialization would take about eight years, and the company is currently working on federal grant proposals to fund further research. Our Anthology, started by recent graduate Jake Oswald, aims to distribute journals in public places that encourage people to write down their names and a short story about themselves. The user then updates the journal’s whereabouts online and connect with people who have also used that journal. Oswald had to change his business idea after learning his original idea to make an efficient way to produce rammed earth construction materials would not be viable. Oswald expects to bring the project to Kickstarter starting in mid-September. Fast Farm, run by recent graduate Brandi Barrett, is a mobile platform that helps connect buyers of farm equipment to local dealers. Buyers send a request to the system, which then notifies subscribing dealerships of a potential customer. Barrett said the process saves time for both buyers and sellers. The app is set to enter beta this November and go to a full release next February, Barrett said. Sophomores Chris James and John Clark started True 360 to develop 360-degree cameras to place in zoo and aquarium exhibits. The cameras are optimized for virtual reality goggles, giving viewers a full view of the habitats from within. James estimates there are about 2,000 exhibits worldwide that could adapt the camera into cages or tanks. True 360 also announced it would begin a pilot program at Blank Park Zoo in Des Moines sometime this month. ISU senior Emma Oliverius started Ivory Lane Events to provide wedding and party planning services for those tying the knot in rural communities. She said her business can succeed by reaching out to those underserved towns in Iowa away from major metros. Propelled Solutions develops drone attachments for law enforcement and emergency responders. ISU senior Nolan Herlocker said the attachments will cost less than $200 each, operate independently of the drone and use their own power supplies, extending the flight time of the drone itself. The company currently has a remote-controlled claw prototype and is developing a flashlight and crash tracker attachment. Herlocker said the attachments could also be purchased for general commercial use. He intends to launch a Kickstarter funding campaign within the year. RenterGate aims to build a web-based rental property manager for landlords, maintenance staff and tenants to organize communication. Senior Brady Trent said the software is available for pre-release trial testing. Lamb Tactical produces custom pistol holsters and mounts for specific firearms. Senior Tyson Lamb said the products will help concealed carriers draw and holster their weapons without coming anywhere close to the trigger. He said preventing access to the trigger in the holster will dramatically reduce the chance of an accidental fire. Lamb said the company is in the process of securing a provisional patent and hopes to have an online store running by next month. Duracinct Biotechnologies, founded by senior Nathan Kimle, is developing a soybean-based alternative for carbauba wax developed at ISU. Carbauba is a high-gloss wax produced in a tree only found in Brazil and has applications in various forms of manufacturing. Kimle estimates a soybean substitute can cost up to half as much as a comparable amount of carbauba. Kimle originally founded the company as U.S. BioCoatings. He said the company is working with the university’s Small Business Innovation Research program to get the technology licensed for sale. Read the full article at amestrib.com.